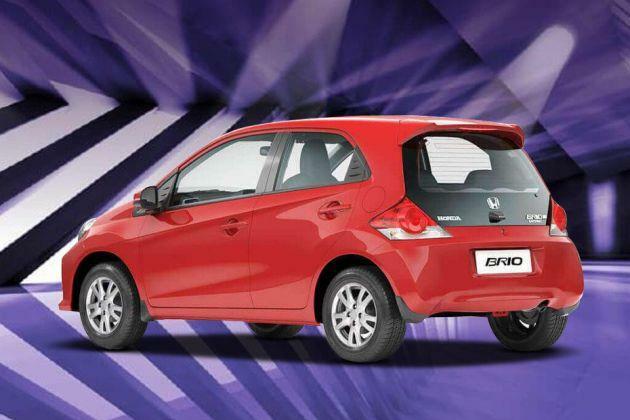 Honda Brio is perhaps one of the best-selling hatchbacks available in Indian car market. Although, it is available with a petrol engine option only, it has managed to give tough competition to other contenders in its segment. This hatchback is available in several trim levels among which, Honda Brio V MT is the mid range variant powered by a 1.2-litre, i-VTEC petrol engine. It is capable of producing 86.8bhp, while yielding 109Nm, which is fairly decent. This engine is capable of producing a peak mileage of 19.4 Kmpl, which is quite good. This hatch is bestowed with an alluring body structure that is equipped with several attractive cosmetics like a chrome grille, large windscreen and a set of stylish alloy wheels. Although, it looks compact from outside, it has ample space inside owing to a large wheelbase of 2345mm. This mid range trim is comes equipped with several sophisticated comfort features including a Honda advanced audio system, which comes with steering mounted audio controls, sporty amber color interior illumination and so on. It is also bestowed with features like driver's seat height adjuster, central locking system and other top rated features. At present, this hatch comes with a standard warranty period of 2-years or 40,000 kilometers, which can be extended by one or two years at an extra cost. The exterior appearance of this hatchback is quite stylish with expressive lines all over. To start with the front, it has a smiley shaped radiator grille garnished in chrome, which is decorated with the company's badge. It is surrounded by oval shaped headlight cluster, which is powered by halogen headlamps and turn indicators. The best part about its front is the distinctly designed bumper that has a pair of fog lamps and an air dam. Coming to the sides, its B pillars and window sills have black color, while the door handles and the ORVM caps are in body color. Its wheel arches have been fitted with a set of 14-inch alloy wheels that are covered with high quality tubeless radial tyres of size 175/65 R14. There is also a full size spare wheel affixed in the boot compartment along with other tools for changing the tyre. The rear end has a lightweight tailgate, which is surrounded by combination lights. The rear body colored bumper is quite large and houses a license plate console. At present, this hatch is available in six exterior paint options including Energetic Blue, Urban Titanium, Rallye Red, Alabaster Silver, Tafeta White and Crystal Black Pearl. This hatchback comes with a total length of 3610mm, overall width of 1680mm, height of 1500mm and a decent ground clearance of 160mm. It has a wheelbase of 2345mm, boot storage space of 175 litres and fuel tank capacity of 35-litres, which is quite decent. The interiors of the Honda Brio V MT trim have been done up with a beige color scheme, which is complimented by silver and chrome inserts. The dashboard comes in black and is equipped with an instrument cluster, AC unit and a music system. The AC vents surround and the gearshift knob has been treated with chrome while the steering wheel and door handles gets silver garnish. The front seats have been integrated with headrests, while the rear has a foldable facility, which will help to increase the luggage space. Its cabin gets an amber color illumination, which further beautifies the interiors. Other utility aspects include a tachometer, driver’s seat height adjuster, accessory power sockets, rear parcel shelf and front door pocket cover. This hatchback is powered by a 1.2-litre i-VTEC petrol power plant that is incorporated with a programmed fuel injection system. It is based on a single overhead camshaft valve configuration along with 4-cylinders and 16-valves, which displaces 1198cc . It can produce 86.8bhp at 6000rpm in combination with a peak torque output of 109Nm at just 4500rpm. It is paired with a five speed manual gearbox that allows the front wheels to draw the torque output. This engine can generate a mileage in the range of 16.2 to 19.4 Kmpl, which is quite good. It takes 12.5 seconds for this vehicle to reach a 100 kmph mark and it can achieve a top speed of approximately 140 to 145 Kmph. Its front wheels have conventional disc brakes , whereas its rear ones are equipped with drum brakes. Whereas, its front axle is coupled with McPherson Strut and the rear axle is equipped with a torsion beam. This trim also has an electric power steering system that has a turning radius of 4.5-meters and makes handling easier. This Honda Brio V MT is the mid range variant and has been incorporated with quite a few aspects. It has list of features like electric power steering, an air conditioning system with heater, driver's seat height adjuster, tachometer, all four power windows with auto down function, electrically adjustable outside rear view mirrors, fuel consumption display, accessory power socket, rear parcel shelf, front door lining pockets, front sun visors with passenger side vanity mirror, front seat back pocket and several other such features. This trim is also blessed with a sophisticated Honda audio system that features an MP3 player, FM/AM radio, USB port, AUX-In socket and has steering mounted audio controls. The car maker has bestowed this trim with several important safety features that keeps the occupants protected. This hatch is built on ACE body structure, which absorbs most of the impact caused in case of collision. It is incorporated with features like an engine immobilizer, rear windscreen defogger, driver seatbelt reminder, day/night inside rear view mirror, high mount stop lamp and a full size spare tyre. Apart from these, it also has central locking system, keyless entry, dual horn and several other such aspects. 1. Asserting body design and style gives it an advantage. 1. Safety standards need to be improved. 2. Price tag is slightly expensive.